Wear your Chrysalis Tree of Life expandable bangle and connect to all life on our planet. Connecting Father Sky with Mother Earth, it offers a wealth of love, wisdom and protection. The dragonfly reflects change and transformation, bringing good luck and enlightenment to each of our lives. 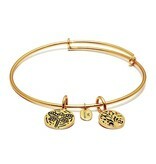 14k Gold Plate Petite = 6 to 7.5 inches Your bracelet will come packaged in a Chrysalis suedette pouch. Stack them up for maximum effect ! !